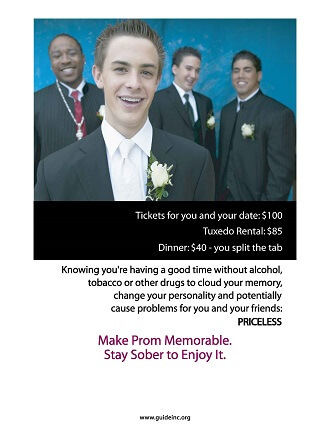 Safe and Sober Prom Posters | GUIDE, Inc. 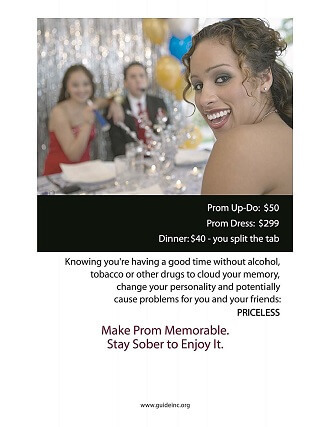 These Safe and Sober Prom Posters (23 3/4 x 18 inches) contain messages to encourage teens to be safe on prom night and participate in activities that do not involve drinking. The full size boy poster can be viewed here. The full size girl poster can be viewed here. Note: Ordering a quantity of 1 means you will receive a package of 4 posters. Order 2 to receive 8 posters, 10 to receive 40 posters, etc. Please contact Alexis Cato at alexis@guideinc.org for questions related to this product.